1527. 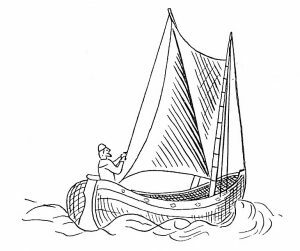 The first known illustration of a spritsail rigged boat (from an English chart of 1527 in Nordenskjold’s ‘Facsimile Atlas to the Ancient History of Cartography’). BRITISH yachting, properly so called, dates from the Restoration, and is of Dutch parentage. There is a tendency to try to find the origin of the sport by chronological research, but this method seems to be unsatisfactory. At best it might be possible, in this way, to discover one or two bare mentions of yachts earlier than the first of the instances which have hitherto been collected – the name ‘yacht,’ indeed, occurs in French at least as early as 1551 – but in any case it is certain that the labour entailed by such a search would be out of all proportion to any possible result. For practical purposes it seems to be clear enough that this method has been carried to its logical conclusion. It cannot be maintained, however, that the result is altogether satisfactory. It is interesting indeed to learn that the practice of sailing small vessels exclusively for pleasure sprang up in Holland during the first half of the seventeenth century, and it is important to know, as has long been known, that the first English yachts, properly so-called, were of Dutch origin. But it is impossible to reflect upon even the scanty array of facts here available without coming to the conclusion that there are various questions of importance to which answers must be found before the origin and meaning of the movement can be satisfactorily explained. We were a seafaring nation many centuries before the Dutch had any separate existence: why, then, did not the movement begin with us? And why was it delayed till the seventeenth century? The fact is that no seed can bear good fruit unless it falls upon good ground. The germs of yachting may have existed before the Stuart era, but the ground was not yet prepared to receive the seed. In order to appreciate the difficulties that lay in the way of the establishment and growth of such a sport, it is necessary, in the first place, to take a general view of the conditions which prevailed at sea down to the time when Charles came to his own again. Before pleasure-sailing of any kind can exist, certain conditions must be fulfilled. The peace of the sea must be so far established that reasonable security is offered to life and property, and a suitable type of craft must be evolved. It is also important to remember that yachting, like all other costly pleasures, can only flourish in a country which has acquired the necessary means and leisure. It is far from the present purpose to back this proposition with solid arguments drawn from writers on economics; let it suffice to advise the reader, should he wish to sound the depths of this matter, to take counsel with Dr. Cunningham. In brief, enjoyment goes hand in hand with prosperity, not with the struggle for life; and if, in opposition to this view, it should be urged that English yachting took its origin at the Restoration, as indeed it did, and passed through its infancy during a period which was far – very far – from being one of prosperity, the true answer seems to be that Stuart yachting, like the much-vaunted ‘golden days’ which it accompanied, was, after all, but a false dawn. Under Charles II the sport was not taken up by the nation. It first came into existence as a hobby of an extravagant Court, which took no thought for the morrow. For a brief period, while money came readily to Charles’s hand, it was the talk of the town; but it languished with the languishing fortunes of the Court, until, long before the end of the reign, the fleet of yachts had gone to swell the Navy List, and there was no royal yachting to speak of save for purposes of State. Only an occasional small pleasure-craft remained here and there in private hands to keep the sacred fire burning. The King had, so to speak, squandered capital. The boom in yachting was as fictitious and as transitory as was the splendour of his Court, and there was much leeway to be made good before the sport could be established upon its only sound basis, the taste and opportunity of the nation. It is easy to give too much credit to Charles. The most that is his due is to say that he saw the pleasure of the path, and would fain have followed it; but that by his folly he strewed the path with obstacles which effectively prevented it from becoming a highway for many years to come. The reason why the dawn of yachting, false dawn though it was destined to be, was so long delayed is to be sought in the fact that the fulfilment of the necessary conditions was a slow matter. To-day, when the dominating factor of life afloat in every quarter of the globe is that Pax Britannica which is founded upon the omnipresence of naval force, it is not quite easy to remember that, even two and a half centuries ago, there was practically no peace even in home waters. The corsairs of Dunkirk gave constant trouble, in peace scarcely less than in war. And abroad the conditions were still more unfavourable. Beyond European waters there was scarcely a pretence at law and order till long after this date; and what the state of affairs was within reach of the Barbary ports will readily be called to mind by all who have any acquaintance with early romances. In the seventeenth, and until well into the eighteenth, century the Christian who had been taken by a Sallee rover and sold into slavery is a stock character in fiction. It is a fair enough jest for a ‘Prehistoric Peeps’ artist to represent a game of ping-pong in the Stone Age as interrupted by the advent of a Plesiosaurus. But the historic fact would be that primitive man, in the days when such-like fearful wildfowl roamed at large, would stick severely to his hunting, and would entertain no thought of any less utilitarian pastime. So it was with our seafaring ancestors of the Middle Ages, and even of the Tudor period. There were four reasons which might take a man to sea, but they were all strictly businesslike. It might be necessary to cross the sea on a journey; trading voyages were, of course, common – so, too, were piratical cruises. Least common of all were what we would look on as orthodox employments of naval force. But the net result was clear enough. When a man went to sea he took his life in his hand. Therefore, unless he had a taste for the fiercer kinds of sport, he went as little as might be. And, obviously, anything in the way of pleasure-sailing in unarmed vessels would have been out of place. It should also be remembered that the law of the land did not run beyond low-water mark, and that the law of nations was still all but undreamt of. The natural result was that fighting afloat was universal and chronic. Piracy for many centuries was as much the profession of a gentleman as knight-errantry; and if the victims did at times gain the ear of their Prince, their usual satisfaction lay in a scarce-needed permission to make reprisals on the fellow-countrymen of the wrongdoer. The resulting state of affairs is illustrated by the true and tragic history of Sir Andrew Barton. Barton was a Scotch captain who had a grievance, and consequently took out letters of marque, against certain Portingalls. So he went to sea to find some Portingalls from whom to recoup his losses; but, owing, as he put it, to the difficulty of telling one ship from another, or – what is more likely – owing to a wilful purblindness, it so happened that he preyed upon English shipping. The consequence was that a neat little expedition was sent afloat, commanded by two adventurous English noblemen, and Andrew Barton (the ‘Sir’ appears to be a matter of poetic courtesy) ended his life as the ideal pirate should. Here we have two sides of the question, both of them decidedly sporting. In plundering English ships in the narrow seas, Barton must have known that he was backing his luck with the odds against him; in going out to catch him, the Howards were looking for excitement, in the absence of any other interesting occupation, and were also seeking, no doubt, the bubble reputation. Long lists might be made of the names of sportsmen of this class, both gentle and simple, both great and small. Prégent de Bidoux, Anglice ‘Prior John,’ and ‘Arripay,’ whose countrymen called him Harry Page, are but later representatives of the industry which existed in our waters even before the advent of the mythical Hengist and Horsa. It would be more pleasant could we dwell only on the vagaries of these legitimate pirates, if we may call them by such a strange-sounding name; but, unfortunately, a difference of nationality was by no means necessary in the thirteenth century to make man, or at least man afloat, a wolf to man. The spirit of nationality was as yet far from fully developed. Ships, for the most part, sailed under the banner of their town, or, where they were owned by a man of blood, under the device of their owner. So family feuds and town feuds and jealousies were regularly fought out at sea whenever occasion offered, and complaints by the West against the men of the East Coast, or by the Isle of Wight and Southampton against the Cinque Ports, were just as common, and every whit as difficult to deal with, as national complaints made on behalf of the Venetian galleys or of the Hanseatic League. Obviously, there was here no room for quiet pleasure-sailing; and though throughout the Middle Ages we constantly meet with instances of vessels which it has become customary to call yachts, belonging to royal persons, yet for the present purpose such craft can be dis­missed as being of no interest. There was no spice of pleasure about the famous trip that Edgar made on the Dee in a boat rowed by eight Kings. The event, if not a monkish parable, was purely political, and, as has been well said, the same end would have been gained if Edgar had paid eight watermen to row the boat, and had stowed the Kings handcuffed in the stern-sheets. At all events, the boat used was doubtless a waterman’s boat hired for the occasion. And throughout this long, dark period, whenever the ship of the King or chieftain differed from the ordinary run of ship, it did so in being either bigger if intended for war, or more profusely decorated if intended also as a passenger vessel. It is needless to seek for details in the matter, for there is absolutely no trace whatever of evidence that any medieval Prince or King ever had a ship differing in type from the ordinary ships of the age. We know exceedingly little of the details of the dromons, of the esneccae, of the cogs, or of the hundred and one other medieval types whose names survive, but we know enough to be sure that none of them were yachts properly so-called. Some, of course, were faster than others, esneccae perhaps being among the fastest, and one or two of this type have been spoken of as yachts. But there is no doubt that they were merely fast galleys used in the packet service between England and Normandy; and that a King should own one is no more strange than that he should have his own horse to ride. In the case of the celebrated White Ship, whose unusual colour has perhaps combined with her unhappy fate to perpetuate her memory, there seems to have been some notion of sport or pleasure. The sporting element lay in the intention to race across Channel with her consort; but unfortunately the pleasure was looked for not in any appreciation of wind and sea, but at the bottom of the wine-flask. As to the ship herself, there is no reason to suppose that in essentials she differed from her contemporaries any more than did the purple-sailed and gilded galley in which, more than eleven centuries before, Cleopatra went to meet Antony. During the later medieval period the prevailing conditions continued to be quite unfavourable to the prospects of pleasure-sailing. England stepped out of war into war; the long struggle with France was barely ended when the whole of the attentions of the leisured class in England were absorbed by the Wars of the Roses. Obviously, it would be quite futile to look for yachting here; men were occupied almost exclusively ashore, and such maritime activity as is recorded is limited to occasional mentions of the raiding expeditions of the Earl of Warwick, then Governor of Calais. The war ended at last in a profound peace, but it resulted also in the extinction of those wealthy and leisured classes with whom alone sport could take its origin. The effect was that, all through the Tudor period, the spirit of adventure proposed to itself more solid endeavours than the gratification of a taste which did not indeed exist. Opportunity was to create the taste for yachting; for a century and a half at least men found employment enough in creating the opportunity. The conditions to be fulfilled before anything like yachting in the modern sense of the term could come into being were threefold. National prosperity must be established, a suitable rig must be evolved, and the taste for such a pastime must be created. We may dismiss the third consideration briefly. The taste for yachting is but a modern manifestation of the adventurous spirit which, we are accustomed to believe, is inherent in the English race. It is perhaps beside the point to aver that during a considerable part of the Middle Ages the spirit of adventure, if it did not sleep, at least did not take men to sea. But one of the clearest and most obvious things in our national history is that, during the later Tudor period, the spirit was increasingly in evidence. The spirit necessarily varies with the age. The Northmen in their time – more especially if we accept the story of their voyage to America – were truer yachts­men than was Edgar with his boat’s crew of kinglets or Athelstan with his gilded barge; and similarly, under the Tudors, the true spirit is to be sought less in the owners of the gilded barges which graced the pageants of Thames than in the daring which led the Earl of Cumberland, John Oxenham, or even Francis Drake, to cruise with irregular commissions, or prompted Martin Frobisher, John Davys, or Henry Hudson to devote their lives to the search for new lands or new sea routes. set to work by both sea and land, and maintained only by fishing upon the coasts of England, Scotland, and Ireland.’ It is possible that his figures are somewhat exaggerated, but he undoubtedly proved his contention; and the fact is well established that practically the whole of the North Sea fishing industry was in the hands of the Dutch or of the mariners of the Baltic ports. On the Banks of Newfoundland there were many English fishermen, but in home waters scarcely any. The result, as far as yachting is concerned, is sufficiently well marked. The Dutch became speedily a nation of sailors, and gained wealth and leisure long before we did. A maritime nation in which every man looked to the sea for his daily bread; a prosperity far in advance of the general standard of the age; a territory peculiarly gifted with inland waters – such were the essentials in which the Netherlands of 1600 differed from England; such, too, are the causes which naturally predispose to yachting. These considerations and one other, the evolution of a suitable rig, are common to both Dutch and English yachting, and it has already been shown how the tide of events gave the Dutch a decided advance. Before considering the important question of rig, there is one more very serious matter to be taken into account – the peace of the seas. In this respect also fortune favoured the Dutch, for their yachting was in great measure free from fear of interference, thanks to their coast, well protected by sandbanks, among which no stranger dare venture, thanks also to their splendid inland waters, of which no counterpart is to be found in England. Dunkirk was at this time in the hands of England’s enemy Spain, and had a very high reputation for maritime skill and energy. In war this was well enough, but it did not confine itself to war; in peace Dunkirk as a neighbour was at least as undesirable as during active hostilities, and, with one excuse or another, or often with no excuse whatever, the Dunkirk privateers continued to prey on the shipping of the narrow seas. Of course, a part of this loss fell upon the Dutch, but England was the greater sufferer, both because her coast offered less shelter and because her shipping, being less in volume, was not so well able to stand the strain. The effect, as far as the English Channel and East Coast were concerned, was that things went from bad to worse. When the great Spanish Armada had come and gone, men began, as will presently be seen, to hope that they might safely show themselves at sea without protection. But if this hope was falsified even in Elizabeth’s reign, still more was this the case when ‘Queen Jamie’ succeeded her, a King of much learning but small understanding; and least of all was the hope justified under the utterly inefficient government of Charles. The history, or rather the lack of history, of British yachting is at this time bound up with the story of the Dunkirkers and other pirates; it is a study of cause and effect. He who would appreciate the cause must read of the inefficiency of the naval administration of the early Stuarts, and the effect will lie patent before him. The adventures of that madcap John Taylor, ‘the Water Poet,’ will be given presently as picturesque testimony on behalf of this opinion. And during Taylor’s latter years, when his coasting journeys were well nigh over, the state of home waters became rapidly worse for a time, owing to the incursion into the Channel of the Mahomedan pirates of Sallee. It is pleasant, from a national standpoint, to reflect that the heyday of these infidels was of brief duration, for the keen naval enterprise, which was to the budding Commonwealth as the breath of life, speedily set a period to their maraudings. The Cromwellian navy was great and efficient. It struck a most serious blow at the maritime prosperity of the Dutch, it left the seas comparatively clear of evil-doers, and it raised the prestige of a sea-life in a very marked degree. In all of these respects it advanced the cause of yachting. A detailed narrative of sea-fights would be out of place in a history of yachting, it will be admissible to give only one of many important battles which took place with pirates in home waters during the earlier Stuart period. The whole history of the time testifies to an increase of daring on the part of ‘the Turks’. From the Mediterranean they extended their operations to the Atlantic seaboard, founding the port of Sallee on that coast; and with that as a base they spread gradually northward, scourging English com­merce heavily and defying any protection which the King’s navy could give even in the English seas. The State Papers of the time are full of complaints from merchants and dwellers on the coast, and not without cause. In 1631 Baltimore in Ireland was sacked by these pirates, and the whole of the inhabitants carried into slavery. The natural result of this state of things was that there was no sailing for pleasure in the Channel; there was opportunity in plenty for the fiercer kinds of sport, for a stout seafaring man could take his choice of sides in the game. If the duties of patriotism sat lightly upon him, he could throw in his lot with the pirates, who would gladly receive him; if he preferred allegiance to his country, his due share of fighting would probably be forced upon him. Here is a narrative of one of these encounters, taken from the examination of John Whiddon, gunner of the ship Elizabeth of Plymouth. On June 17, 1640, the Elizabeth, Captain Doves, coming from Virginia, fell in with three Turkish men-of-war off the Lizard. Each of these was bigger than the English ship, and among them they mounted fifty-six guns, while the Elizabeth had only ten; the pirates also were full of men, stated to amount to 500 in all, while of Englishmen there were but thirty all told. However, there was no choice in the matter, for the pirates were the more weatherly and headed the Elizabeth off from the shore. The details of the fight, as they appear in the examination, are meagre, but it is established there that the pirates came aboard, did very great damage, and were eventually beaten off after about eight hours’ hard fighting. Those who love the picturesque must turn to Taylor’s narrative, which, as far as it can be tested, seems genuine enough. ‘At last the Master (Capt. Doves) was slaine, ending his dayes Nobly, likewise the Masters-mate and the Pilot, and quarter-Master were kil’d outright, and having done as much as men could do against so strong an enemy, kept Master Doves company, both in life and death, and in heavenly happinesse. In this terrible turmoyle there were two of the Turkes had got themselves up into the Top, and one of the passengers with a Musquet kil’d them both: one was a man of an extraordinary great stature; he being kil’d, the English did cleave his head, and then they divided it from his carkasse, they showed the head and corps to the Turkes, and with renewed courages and unwearied Valour they haled to the enemy, and in braving manner said, come aboord you Dogges if you dare, and fetch your countryman; but the Turkes finding the businesse so hot, and the men so resolute, that their damnable courages were quel’d, that they had no more mind to assault the English ship any more. So they in deriding and showting to the Turkes, cast the dead body overboard, on the one side of the ship, and the Cloven head into the Sea on the other.’ That was the end of the fight; and, as the remnant of the Elizabeth’s crew worked their battered ship homewards, they ‘discovered eleven small vessels floating on the streame, without sayles, or any men in them at all, which the Gunner of the Shippe doth very certainly believe were taken by the said Turkish men of Warre, and their company carried away by them’ to be sold for slaves. Such was the state of affairs in the Channel in 1640. It leads us to excuse Richard Ferris for his dodging round the Runnell Stone fifty years earlier, and it even speaks a word in favour of the constables of Cromer. And it is obvious that as long as this state of things continued there could be no yachting. If it is any consolation to him, the British sportsman may reflect that the ‘Turkish’ pirates learnt the best of their seamanship from an Englishman, Ward, and during their palmy days numbered among their ‘admirals’ and captains many adventurers from these islands.